We’d love your help. Let us know what’s wrong with this preview of Black Flame by Gerelchimeg Blackcrane. Award-winning author Gerelchimeg Blackcrane has written a compelling novel, set in Tibet, Mongolia and China, about the adventures of a fiercely powerful yet lovable Tibetan mastiff that is sure to join the ranks of other much-read classic dog stories. Kelsang, a Tibetan mastiff, is just a tiny puppy when his mother dies after a vicious fight with a snow leopard. Soon he co Award-winning author Gerelchimeg Blackcrane has written a compelling novel, set in Tibet, Mongolia and China, about the adventures of a fiercely powerful yet lovable Tibetan mastiff that is sure to join the ranks of other much-read classic dog stories. Kelsang, a Tibetan mastiff, is just a tiny puppy when his mother dies after a vicious fight with a snow leopard. Soon he comes to fill his mother’s role as sheepdog for the master, Tenzin, his instincts telling him how to herd the flock on the northern Tibetan grasslands. But one day when visitors see this huge, beautiful purebred, they ply Tenzin with drink and convince him to sell his dog. In no time Kelsang finds himself chained up in the back of a jeep traveling far from everything he knows. To ask other readers questions about Black Flame, please sign up. I want my review of this book to just be go read this book. Everyone needs to read it, so go read it. I’m not even a dog person and I loved it and now I want a dog. Seriously. But of course not everyone will like this book and sometimes I feel like I am not nearly discerning enough when it comes to reading and I generally like everything. I think what was really different about this book was how I liked it as a reader and not as a librarian reading it. I’m a sucker for animal books (and I think I want my review of this book to just be go read this book. Everyone needs to read it, so go read it. I’m not even a dog person and I loved it and now I want a dog. Seriously. But of course not everyone will like this book and sometimes I feel like I am not nearly discerning enough when it comes to reading and I generally like everything. I think what was really different about this book was how I liked it as a reader and not as a librarian reading it. I’m a sucker for animal books (and I think this is why I often hate adult literature, not enough animals), what can I say? Reminds me of Jack London's novels I that it's from the perspective of a dog with a similar complexity to its narrative voice. The novel manages to be engaging and convincing without overly romanticizing the dog's life. A special novel in that the writer is from the Mongolian grasslands where the plot is partly set and he brings this world alive. The exciting adventures of a black Tibetan mastiff. A wonderful dog story set in an exotic location. This review has been hidden because it contains spoilers. To view it, click here. Black Flame, written by Gerelchimeg Blackcrane and translated by Anna Holmwood, is a story about a Tibetan Mastiff named Kelsang who undergoes a series of trials before he finally finds his true home. Kelsang begins his life in the grasslands under a herdsman named Tenzin. While Kelsang great size and might works in his favor, it also works against him: soon two men take him away to fight other dogs. He escapes, beginning a long journey as he willingly and unwilling passes from master to master. 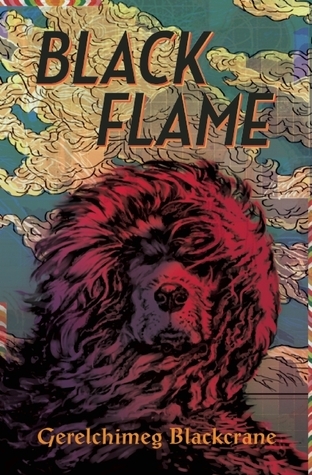 Black Flame, written by Gerelchimeg Blackcrane and translated by Anna Holmwood, is a story about a Tibetan Mastiff named Kelsang who undergoes a series of trials before he finally finds his true home. Kelsang begins his life in the grasslands under a herdsman named Tenzin. While Kelsang great size and might works in his favor, it also works against him: soon two men take him away to fight other dogs. He escapes, beginning a long journey as he willingly and unwilling passes from master to master. As one master becomes more greedy, Kelsang becomes more unhinged. Finally, he discovers Han Ma, who doesn’t try to control Kelsang but offers him friendship instead. Kelsang is separated from Han Ma for a while, but when they are reunited Kelsang’s journey comes full circle as Han Ma takes him to the grasslands once more. In this unusual odyssey, Blackcrane’s story relies heavily on full, lush descriptions. As the story is told mainly from Keslang’s point of view, there is limited space for actual dialogue. Instead, Kelsang’s emotion and the depiction of the grasslands and the city of Lhasa drives the story forward. Blackcrane’s description relies on exaggerated metaphor to portray nature. He writes, “Before Han Ma had time to answer, the cliff did it for him. A crashing that sounded like the sky falling in echoed all around them” (149). This type of writing is starkly contrasted with the action-oriented, almost scientific explanation of Kelsang’s behaviors. Following Kelsang’s point of view, the author explains Kelsang’s motivations and instincts with clarity and plainness: “It wasn’t his experience on the grasslands that was telling him something was wrong, but pure animal instinct” (146). Blackcrane describes the action first, then rewinds to explain how other people were involved in the event. Using this type of omniscient technique, Blackcrane keeps the focus on Kelsang even when he explains ways that human’s affect Kelsang’s actions. What I appreciated most about this book was the penetrating theme of the ways humans can positively or negatively affect dogs, whether domesticated or wild. As Kelsang passed from master to master, it was ultimately Kelsang’s emotions and instinct that drove his actions—and those emotions and instincts were affected by the behavior of his master. Only Han Ma provides a stable, charitable counter for Kelsang through his sensitivity and understanding of Kelsang’s needs. On the other hand, the Great Dane that Kelsang fights behaves ferociously because his master encourages him and—it is implied—rewards him. Through these examples, Blackcrane asks us to consider the effect we have on nature and its animals. This structure is inverted to many American books about dogs, which focus rather on the impact dogs have on people. But Blackcrane doesn’t go to great lengths to explain the human’s emotional connection with Kelsang, or why they need him. It is never explained why Han Ma initially leaves Kelsang behind, or what inspires him to come back for him. Instead, the focus remains on what Kelsang feels. I would definitely include this in a school or public library; it provides a thoughtful alternative to books like Shiloh. Ultimately, this is a book about understanding and belonging. The journey Kelsang sets out to complete is a journey to find his place. This alone is something that all young readers can relate to—as well as the more primal emotions that overtake them when they are tested. Furthermore, Kelsang’s story reflects on the symbiotic nature that exists between human and dogs, and where that bond can turn sour. For any child with a deep love for dogs, this can be a powerful message. Kelsang is an enormous Tibetan mastiff puppy who is born to a shepherding family. His mother is killed early on, and his master is tricked into selling him to an unscrupulous buyer, He gets taken to Lhasa, where he escapes and runs wild in the city. An elderly artist lets him stay in his courtyard and brings the dog food when he comes home, but the two mainly ignore each other. Since mastiffs arevery valuable, other men take him and keep him locked up, which is horrible, since mastiffs like to r Kelsang is an enormous Tibetan mastiff puppy who is born to a shepherding family. His mother is killed early on, and his master is tricked into selling him to an unscrupulous buyer, He gets taken to Lhasa, where he escapes and runs wild in the city. An elderly artist lets him stay in his courtyard and brings the dog food when he comes home, but the two mainly ignore each other. Since mastiffs arevery valuable, other men take him and keep him locked up, which is horrible, since mastiffs like to run. Eventually, he is found by Han Ma, who is a volunteer working to save antelopes, and Kelsang proves to be a great asset in many ways. When Han Ma has to go back to work at a school for disabled children, Kelsang stays with a friend of Han Ma's, and has various adventures guarding a store. When Han Ma and Kelsang are finally able to be together, the two are very glad, and Kelsang is able to roam the mountains, get his exercise, and love his human. Strengths: This is a great book for #WeNeedDiverseBooks since it was translated (very beautifully) from the Chinese. It is a must read with Secret of the Mountain Dog by Elizabeth Cody Kimmel, since both have Tibetan mastiffs! Readers who like classic animal tales, like Jim Kjelgaard's books or Farley's The Black Stallion series will adore this. "Black Flame" is the tale of Tibetan Mastiff Kelsang, who soon after losing his mother is given the role of Sheepdog of the Tibetan grasslands. One day, his master sells him and he is chained to the back of a jeep, travelling far away from all he has ever known. Throughout his adventure he fights with Lhasa street dogs, is captured by cruel humans, and ultimately meets Han Ma – the only master who has ever inspired love and loyalty from Kelsang. It is now up to Kelsang to do all he can to remain "Black Flame" is the tale of Tibetan Mastiff Kelsang, who soon after losing his mother is given the role of Sheepdog of the Tibetan grasslands. One day, his master sells him and he is chained to the back of a jeep, travelling far away from all he has ever known. Throughout his adventure he fights with Lhasa street dogs, is captured by cruel humans, and ultimately meets Han Ma – the only master who has ever inspired love and loyalty from Kelsang. It is now up to Kelsang to do all he can to remain with Han Ma and not lose the only human he has ever loved. Fascinating story about a lesser known dog breed. The author does an amazing portrayal of thoughts, motivations, and life through the eyes of a Tibetan mastiff. This review has been hidden because it contains spoilers. To view it, click here. I loved the book!